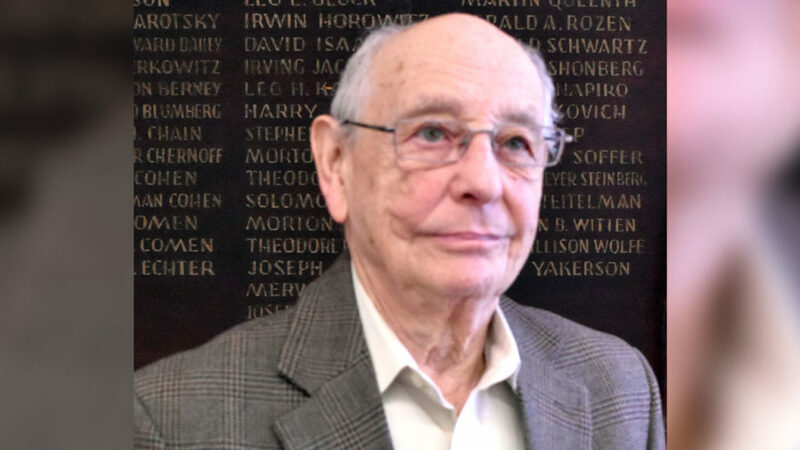 Endre “Andy” Sarkany of New Haven, a Holocaust survivor, will share his experiences living through the mass genocide at noon on Thursday, April 4, in the Quinnipiac University School of Law’s Ceremonial Courtroom, 370 Bassett Road. The speaking engagement, which is sponsored by Quinnipiac’s Jewish Law Students’ Association, is free and open to the public. A light lunch will be served. Sarkany was born in Budapest, Hungary on Oct. 31, 1936. The building he lived in was located inside the Budapest ghetto, which is where he remained during the Holocaust. The building housed a nursery and kindergarten school on the ground floor. The school was affiliated with the Jewish Agency of Hungary. Sarkany’s father was taken to Mauthausen concentration camp in the spring of 1944. Fortunately, he did survive. After WWII, Hungary became a communist nation. Although Sarkany graduated high school in 1955, he was not accepted to university because he was deemed an undesirable element of society. This label was given to anyone who owned a business before the communists took over the country. Sarkany escaped Hungary after the October 1956 uprising and was able to immigrate to the United States. He received his bachelor’s degree from Tusculum College in Tennessee and his master of science degree in applied athematics and computer science from Washington University in St. Louis, Missouri. Sarkany worked for both the McDonald Douglas Corporation and the IBM Corporation. Over the past 10 years, Sarkany has spoken to students about his personal experiences during the Holocaust, living under the brutality of the Soviet regime in Hungary, and finding a home in the United States. Sarkany is married, has a daughter and son, and five grandchildren.